Every now and again someone puts soap in a fountain here in amsterdam. This happend last week at the American hotel. 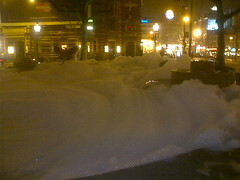 All of leidseplein was covered in little bits of bubbles that looked like snow. Even mindcaster said, "damn it's snowing'.